A few posts ago, I mentioned that I had bought a biography of Louisa May Alcott at the Trinity College Booksale. This book conveniently ties in with my Landing Book Shelves project since Alcott’s best-known novel Little Women and its sequels are residents on the landing. Little Women was written in 1868 and Good Wives, the second volume in 1869. Both stories were published together in 1880 as Little Women. 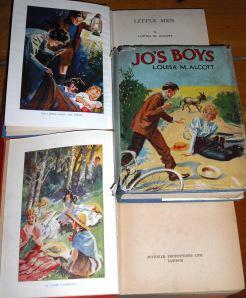 Alcott continued the saga in Little Men (1871) and Jo’s Boys (1886). Sadly, none of my volumes dates from that early on so they have no financial value. I think I bought all of them in second bookshops several years ago to replace my original childhood copies. They are from a series called Juvenile Library and all have a colour plate in the front depicting the characters. Only Jo’s Boys still retains its illustrated dust jacket. As you can (just) see from the photograph the girls are depicted as rather more glamorous than is consistent with the novels. In common with so many other teenagers, I read and loved Little Women and I am sure that I was not the only one to identify with and be inspired by, the lively, tomboyish character of Jo March. In sharp contrast, Meg was too good and youngest sister Amy was too fine and fussy. Poor saintly Beth died after illness and decline, which would not have inspired anyone a great deal. I also remember being deeply disappointed that Jo eventually married Professor Bhaer instead of Laurie, the wealthy boy next door. I wanted fun, romance and frivolity but got practicality and companionship instead. It is strange to pick up an old childhood favourite to re-read and then perhaps to revise long held memories of a cherished book. I started to read the opening chapters of Little Women, revisiting the March sisters as they prepare for their Christmas festivities. After such a lengthy passage of years, I now find myself not particularly in sympathy with the constant striving for goodness and selflessness on the part of the girls. While I can appreciate the solid work ethic and the ability of making the best of what they had, so much virtuousness is hard to take. The emphasis on womanly attributes and virtues is of course strange from a twenty first century perspective. During the progress of the novel, poor Jo is urged to put away her boyish ways and become a woman; an angel of the home. This is in contrast to the eldest sister Meg who is already well on the way to conventional, domestic womanhood.